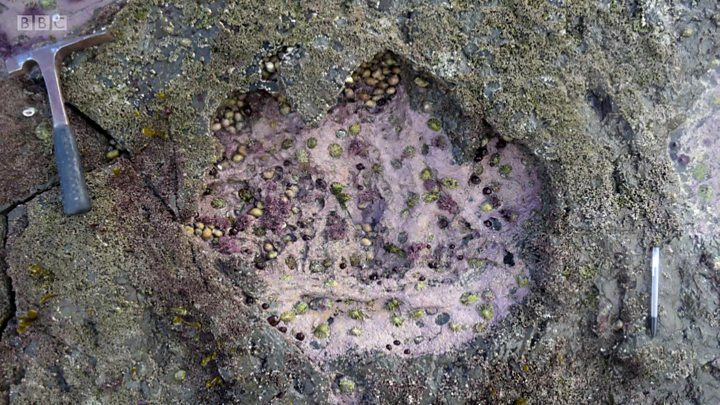 Devan Chavez, a spokesman for the Utah Division of State Parks, told the Washington Post that at least 10 of the larger footprints left by dinosaurs, ranging from 3 to 17 inches (8 to 43cm), have disappeared in the last six months. "There are few other places where visitors can hike, swim, boat, and relax right next to dinosaur tracks," park manager Josh Hansen says. 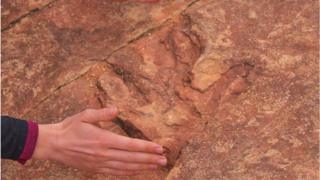 Some of the larger tracks were left by a dinosaur called a Dilophosaurus, which was "about the size of a small horse", according to Mr Hansen. Recently, a juvenile was caught with two tracks in his hands as he was about to throw them in the water, Mr Hansen says. The vandalism has not been intentional, and a majority of it has been done by kids who "just want to make a big splash in the water," he added. Mr Hansen told the BBC the park will be able to recover some of the tracks, but it all depends on how they hit the water and if they have shattered in the process. In a statement on the Red Fleet State Park Facebook page, park officials advised visitors not to disturb any rocks on the dinosaur track. They mentioned while it is not illegal to throw rocks into the water, it is illegal to displace those containing tracks. Park officials are looking at options to solve the problem and for now, have put additional signs in place to discourage any rock throwing. Citations will also be used as a preventative measure.